informative booths to network with experts and learn about Asian carps through displays. 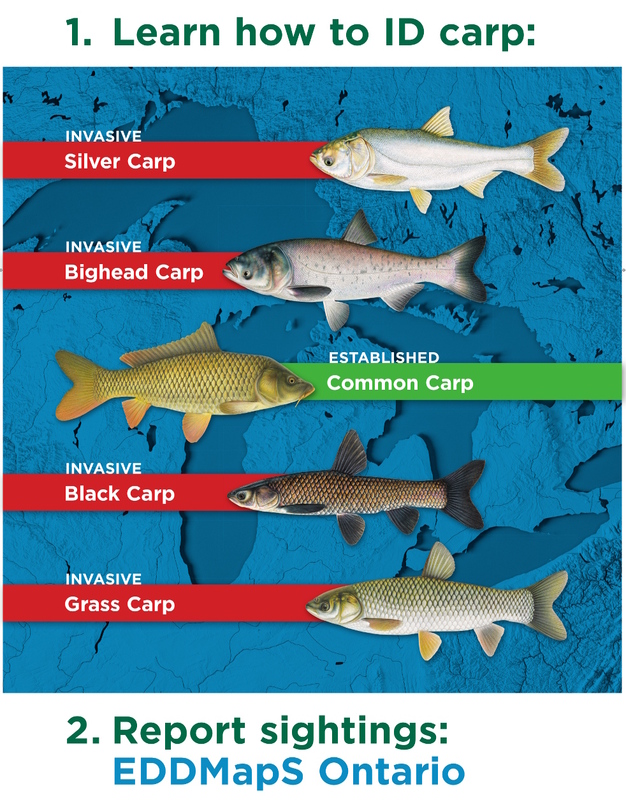 January 2019 – FOCA has created a new infographic to help you identify Asian carp. Be part of the fight to prevent the spread of invasive species. 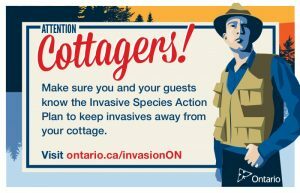 1) Make your own Cottage Action Plan, to help prevent the spread of invasive species in Ontario cottage country. 2) Write a letter to the Minister of Fisheries and Oceans and the Minister of the Environment to request immediate action to stop this invasive fish from entering the Great Lakes. Call on Prime Minister Trudeau to request that the Trump administration ensures that the short term efforts to prevent an invasion do not fail, and to stress that the U.S. must establish permanent ecological separation between the Mississippi and Great Lakes basins. With information from U.S. Environmental Protection Agency and Ontario Federation of Anglers and Hunters. Of the many species of Asian carp, the Bighead and Silver carp, averaging 3 feet long and weighing 60 pounds, pose the greatest threat to the Great Lakes. They are avid filter feeders and can eat up to 20 percent of their body weight in plankton per day. Plankton is the food that most aquatic species rely on; therefore carp have the potential to displace native fish and other species. The Silver carp are slightly smaller but have been known to cause injury to boaters as they jump out of the water when disturbed. The Asian carp were imported into North America in the 1970s to be used in southern United States aquaculture operations. Flooding allowed the fish to escape in to the Mississippi and Illinois rivers in the early 1990s and they have been advancing towards the Great Lakes ever since. What is being done to protect the Great Lakes? Almost a decade ago, the U.S. Army Corps of Engineers, the U.S. EPA, the State of Illinois, the International Joint Commission, the Great Lakes Fishery Commission, and the U.S. Fish and Wildlife Service began working together to erect and maintain an underwater electric barrier between the carp and Lake Michigan. There are now 3 electric barriers in the Chicago waterway to assist in protecting Lake Michigan from carp introduction. There has also been a 1,500 foot fish barrier fence installed at Eagle Marsh, near Fort Wayne, Indiana, to block advancement of Asian carp into Lake Erie. The U.S. Army Corps completed DNA monitoring to identify the location of Asian carp in the Chicago canal and found that they are as close as one mile from the barrier. With support from the Obama administration, the U.S. Army Corps of Engineers are working on a 4 year study to determine how to keep the carp out of the Great Lakes. The study is under attack by many environmental groups saying that they need to work more urgently to solve the problem. The Great Lakes St Lawrence Cities Initiative and the Great Lakes Commission have raised funds to go ahead with their own study to come up with a plan to determine how to re-establish the natural separation between Lake Michigan and the Mississippi basin. What risk do Asian carp pose to Ontario Lakes? If Asian carp are able to enter the Great Lakes and establish a population, they will have detrimental effects on commercial and sport fishing industries, recreational boating, and tourism across Ontario. The Asian carp consume an enormous amount of food that other aquatic species rely on, therefore displacing native fish and other species. The Department of Fisheries and Oceans has committed $400, 000 towards the development of a risk assessment, coordinated along with the US Great Lakes Fishery Commission. This assessment would identify vulnerable tributaries that are at risk of carp invasion and determine techniques for prevention of the introduction of carp into the Great Lakes. 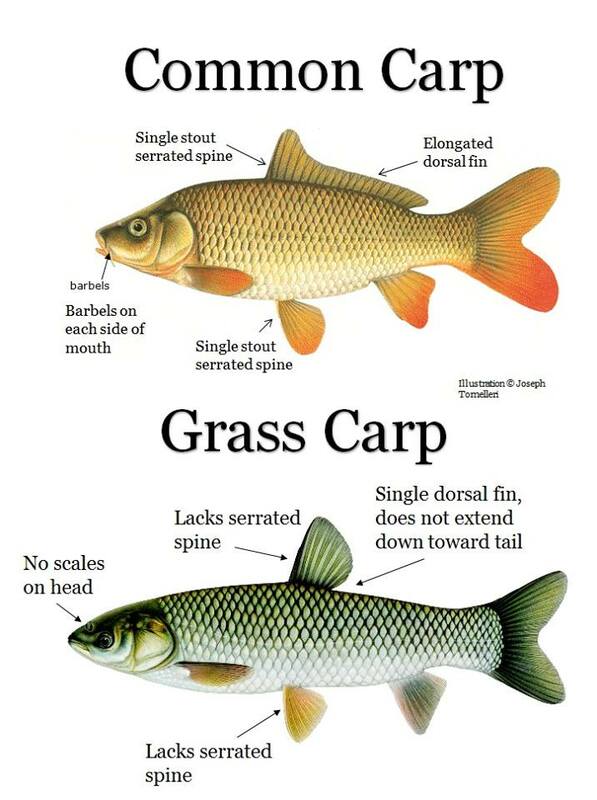 Also, the Ontario MNR is developing a rapid response plan for the introduction of carp. January 26, 2016 – Sound could be the answer to keeping invasive silver carp out of the Great Lakes. A recent study found that it’s a certain kind of sound that could be the key to scaring off unwanted fish. Find out more and listen to a sample of one of the sound files researchers used here. 2014 – The invasive Asian carp are now closer than ever to the last barrier of defence between the infested Mississippi and Illinois Rivers and the Great Lakes. A series of three electric barriers on the Chicago Sanitary and Ship Canal is all that keeps the Asian carp out of the Great Lakes and it is feared that a heavy rain could flood the Des Plaines River, allowing the carp to breach the barrier. Environmental and conservation groups have been urging the Illinois and Obama administration to take action by closing the shipping locks. This has set into motion a study, by the U.S. Army Corps of Engineers, to be completed over the next 4 years. The Chicago barge and tour boat companies argue that closing the locks would have detrimental effects on their businesses.